Chef Joseph Heppe, previously of Untitled, will head the kitchen at Oak + Char. He's pictured here at the restaurant's host station. 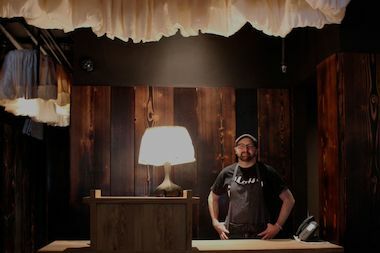 RIVER NORTH — A new restaurant that uses charred wood on the walls and in the kitchen will open this month in the former Graham Elliot restaurant at 217 W. Huron St. The name Oak + Char will be easy to remember for diners inside the 150-plus seat restaurant, where oak barrels will cure pre-mixed cocktails, black metal oak leaf sculptures serve as doorknobs and light fixtures, and the walls are lined with blackened Douglas fir planks that designer Jordan Mozer of Mozer and Associates charred himself in his West Loop backyard. In the kitchen, oak, pear, maple, cherry and other woods will slow-roast all day in multiple smokers. Head chef Joseph Heppe said he only had minor adjustments to make in the "Master Chef" judge's former kitchen, 217 W. Huron St., which was updated shortly before it closed early this year. "The kitchen is beautiful — it's like a Cadillac," the former Untitled chef said. "Still, we wanted to put our own impression into the kitchen. We got a tandoor, which is an Indian clay oven ... We want to focus both on the natural cooking techniques and just that raw fire." The executive chef said the menu will change often, and combine different cuisines within the same dish. "Think an Italian barrata that's served with naan bread," he said. He hopes to source most of his ingredients locally and rotate through seasonal dishes. Heppe isn't the only Untitled alumnus on the Oak + Char team. Managing the restaurant is Art Mendoza, who served as chief operating officer at the River North restaurant, along with his son, Tyler Mendoza, who managed Untitled's bar. Mae Governale, formerly of Longman & Eagle and Thalia Hall, will head the bar program at the restaurant. Art Mendoza said the team is ready to open "any day now" and is just waiting on paperwork from the city before opening the doors — and the oversized industrial windows, if it's warm enough. The restaurant will open first with dinner service, with menu items in the $30-$40 range, and later add lunch, with less expensive plates around $20 and under. Graham Elliot closed New Year's Day after the chef says he had trouble finding a concept that worked in the space.